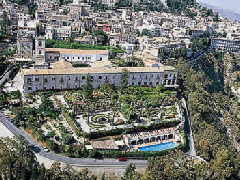 One of the most famous monastery-hotels in the world, The San Domenico Palace only began to accommodate guests in 1896. With origins dating back to the 15th century, the hotel’s views across the Ionian Sea and to Mount Etna were described by Goethe in 1767 - "To have seen Italy without having seen Sicily is not to have seen Italy at all, for Sicily is the clue to everything." Oscar Wilde, Guy de Maupassant, D H Lawrence, and Richard Wagner were all patrons, as somewhat less gloriously was Field Marshall Kesselring who made San Domenico his headquarters during World War II. The hotel is made up from two separate structures: the original 15th century convent, and a late 19th century Grand Hotel wing.